As the “Gateway to the Lakes,” Chisago City is part of the chain of five small towns that make up the community of Chisago Lakes. Nestled along Highway 8, these small towns work together, yet are uniquely their own. Chisago City’s multitude of lakes, invite fishermen from all over to cast a line, vying for a prize winning catch. In winter, drill a hole next to others in the ice house villages on the lakes. Take advantage of the hiking and beauty in all seasons and stay the night in a traditional hotel or a cozy cabin at Ojiketa Regional Park. Grab a bite to eat at a café, bar and grill or pick up something quick at the local deli. Seek out treasures of days past in the antique shop and enjoy the vibrant farmers market from spring to fall. Find fashions and gifts, jewelry and wood sculpture, all in this fantastic town. The entrance to Chisago City, with the majestic Winery on the left and the peaceful view of Green Lake on the right, signals you’ve reached the “Gateway to the Lakes”. With nine parks, Chisago City offers many outdoors spaces to visit. 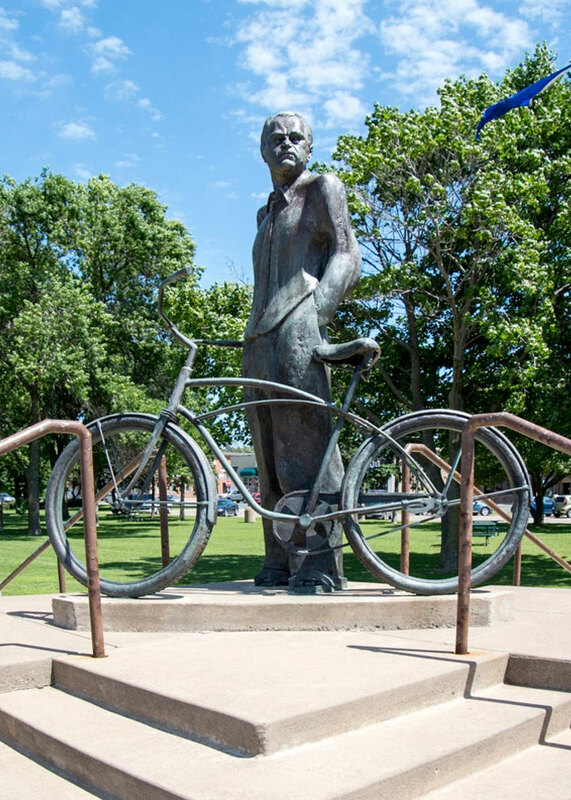 Centrally located in the town is Moberg Park, which pays tribute to Swedish author Vilhem Moberg who traveled the area on bike in the 1950s and wrote, The Emigrants, a fictional story series about Swedish characters Karl Oscar and Kristina Nilsson. Snap your picture next to Vilhem’s statue and attend one of the many seasonally inspired events, including the town celebration of Ki Chi Saga Days in August. Chuckie Lundquist Park, with its skate board area, ice rinks, and paved trails is a popular gathering place for both youth and adults. Paradise Park, host to the Chisago Lakes Triathlon, offers a great place to swim, fish and picnic. Ojiketa Regional Park, formerly a Girl Scout Camp, with its 70 acres of woods, cabins and shoreline, is a serene place to get in touch with nature. At Ojiketa, walk the wooded trail, lounge on the sandy beach, and ring the old girl scout dinner bell. Vilhelm Moberg is one of the best-known Swedish authors. He wrote about emigrant Swedes who comprised the largest ethnic population that settled Chisago City in 1855. He did it with a series of books that speak to a time when more than Swedes were coming to America. Moberg described the pain of forsaking one’s homeland and going to a fate uncertain, leaving starvation and even greater uncertainty for the hope of a new and better life.